This posting has nothing to do with telomeres but a more to do with historiography. Have you ever wondered why Jesus was in Jerusalem for Passover? He was Jewish and celebrated Passover. Have you ever wondered what historical event Passover commemorates? 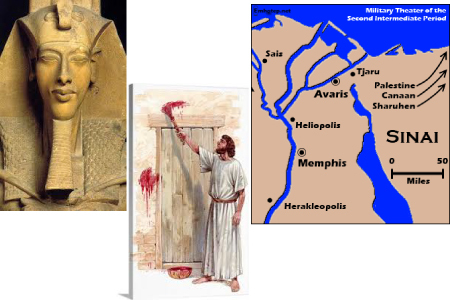 I think the answer may be hidden in plain sight, as clear as the nose on Akenaton’s face. In my unqualified opinion, the Talmud’s obsession with Egypt and the clear record of the Hyksos people can only mean one thing. When the proto-Israelites were forced out of Egypt by Upper Egypt’s Ahmose, there was a price they exacted. This is the etymology of the word, “avarice”. The “alternative history” that emerges is can be a gateway to a very clear understanding of history albeit would strike many people as disturbing. But then again, those who forget history are doomed to reinvent it. Something pretty gruesome went down in Avaris that night and despite over 3,000 years of obfuscation, the truth may be more than a little disquieting. It is like reading Christian Apologetics from the 3rd century or Native American accounts of massacres. Let those who have ears, hear. For the rest, parables will suffice. Happy holidays and may the truth and the kingdom of god be amongst you.